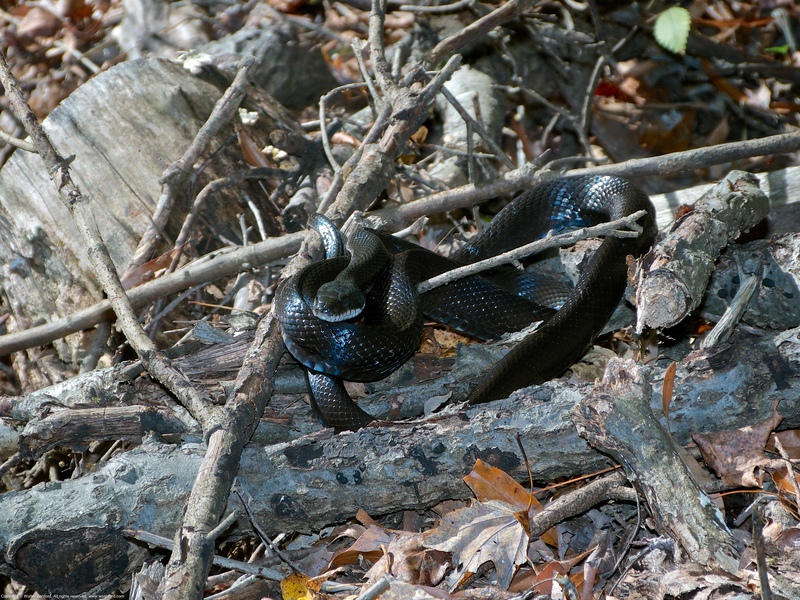 A black snake was spotted basking on a man-made brush pile at Huntley Meadows Park, Fairfax County, Virginia USA. This individual is either an Eastern Ratsnake (Pantherophis alleghaniensis) or Northern Black Racer (Coluber constrictor constrictor). 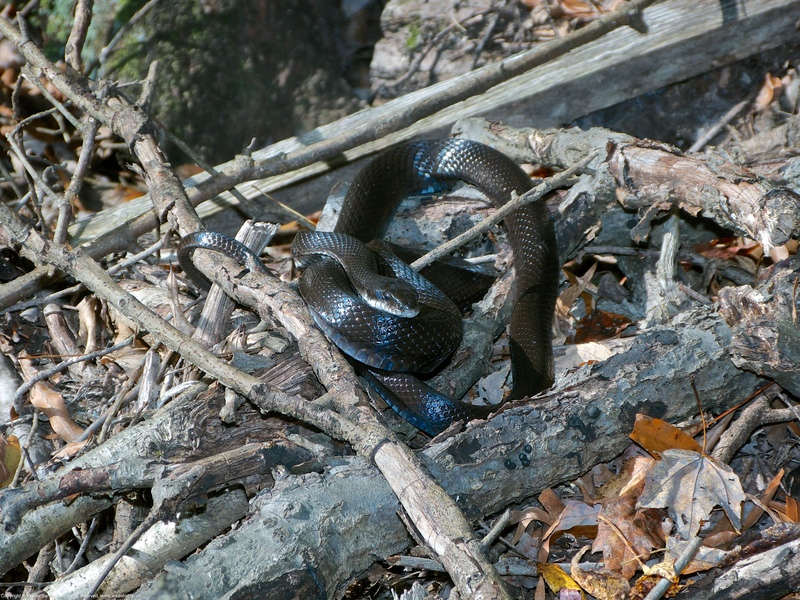 According to Kevin Munroe, former manager at Huntley Meadows Park, Eastern Ratsnake can be differentiated from Northern Black Racer by looking at their eyes. Northern Black Racers have a huge, all-black eye with an “eye-brow” ridge (makes racers look angry and somewhat dangerous all the time), while ratsnakes have noticeably smaller eyes with a black/white pupil/iris pattern (which makes them look more friendly/human). Also racers would never sit still long enough for you to take pictures, or at least it would be harder. Ratsnakes are pretty laid-back and easy to approach, while racers are very skittish and quick to flee. Ratsnakes mostly eat small mammals and young birds/eggs, while racers feed mainly on other herps like snakes, lizards and frogs. Ratsnakes are stealth/tracking hunters that smell out nests of young rodents and birds, while racers are active chasers/hunters/sprinters, which may be why they have such different personalities. Source Credit: Kevin Munroe. Based upon Kevin’s guidance, I think this individual is an Eastern Ratsnake. Another black snake was spotted on the ground, about 20 feet from the brush pile. The snake wasn’t moving, but the vegetation was too dense to get a clear view of the subject. 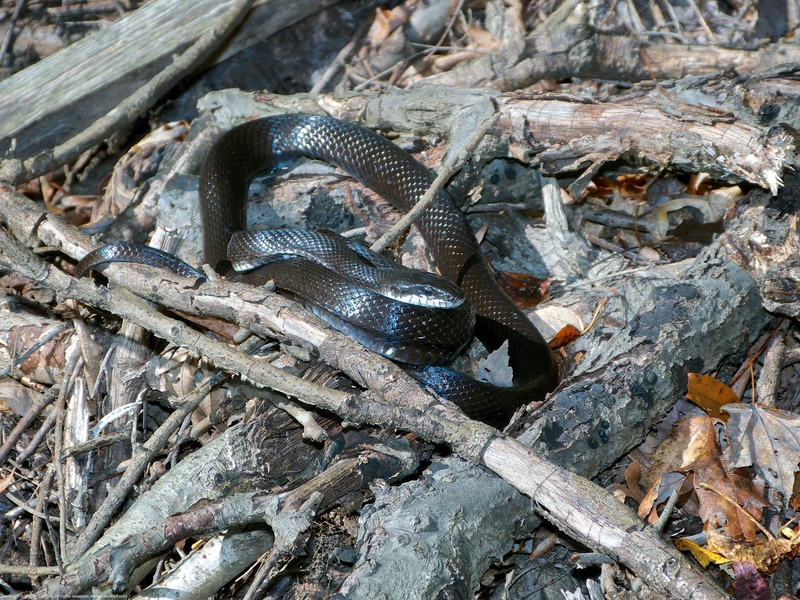 Related Resource: Another black snake, a blog post by Walter Sanford. This entry was posted on January 17, 2018 at 4:00 am and is filed under Aperture, Canon 580EX Speedlite, digital photography, natural science, Panasonic DMC-FZ150, reptiles, wildlife photography. You can follow any responses to this entry through the RSS 2.0 feed. You can leave a response, or trackback from your own site. I believe black rat snakes such as this have keeled scales. Black racers have smooth scales. That’s good snake scale knowledge, Timothy! My next blog post features close-up photos of another Eastern Ratsnake in which the keels can be seen more clearly than in the wider views shown here.